Frame is constructed from solid oak, finished in a natural bleached oak finish. This wonderful curved back sofa is hand crafted of sturdy oak in a slightly distressed white wash finish. 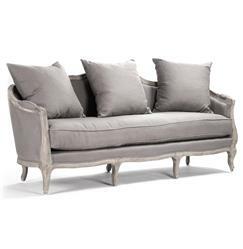 Upholstered in natural linen, this French inspired sofa lends vintage elegance to any living room. Two 24" and two 18" linen toss pillow comes with this sofa. Coordinating armchair and settee available as well.